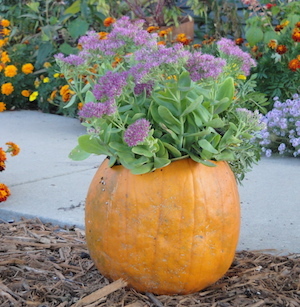 A pink sedum looks pretty in the orange pumpkin. I stole this fall decorating idea from an item I saw in a Gardener’s Supply catalog. The catalog was selling a ceramic, pumpkin-shaped pot to display fall-blooming plants. Very cute, but why not use a real pumpkin? The pots start at $19.95 (not bad, considering how expensive pots are) but pumpkins each cost $3 at the Bridgewater Produce stand outside of Northfield. I’ve done this several times, using perennials that were on sale as well as annuals. I cut the tops off the pumpkins and slashed a couple of cuts in the bottom for drainage, cleaned out the seeds, added a little potting soil, and pushed the plants into their new home. I’ll find a place for the grass and mum in my gardens in a few weeks, and the petunias will go in the compost pile. My only concern for the planters is that the pumpkins will rot and cause some damage to the roots of the plants. We’ll see. UPDATE from 2018: I have done this several years now, and the pumpkins hold up as long as you would want a pumpkin to last. The pumpkins get soft, of course, depending on how long you keep them outside and how damp the weather is. But for a temporary, seasonal decoration—not bad! 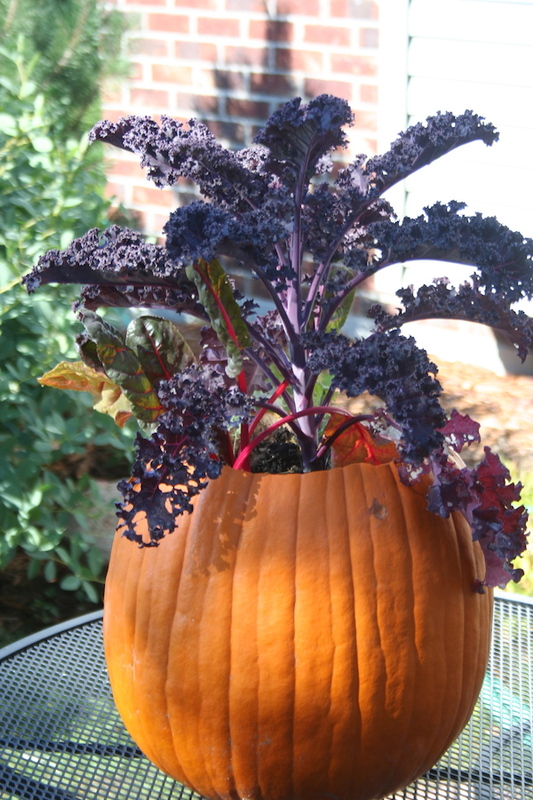 Purple kale makes a terrific focal point in a pumpkin planter—spooky! that is VERY cute! I love that idea. If you used the craft pumpkins they’d last even longer.